SDF is an antibacterial liquid that can stop the growth of tooth decay and treat tooth sensitivity. No anesthesia or invasive dental treatment is required to apply this substance. It is simply painted on the affected area, dried, and coated with a fluoride varnish to cover. It has been scientifically proven to stop the growth and symptoms of a cavity, so that more aggressive treatment can be delayed, or in some cases, avoided. This is ideal for some patients who are very young or have special needs and would otherwise require moderate to deep sedation for fixing cavities. The silver in SDF stains any decayed tooth structure dark. While healthy tooth structure is not stained and remains white, a dark black stain will be seen wherever the cavity is. While this result is not desirable esthetically, it is a much preferred and conservative approach if the alternative treatment requires sedation of a young child. Many of our parents have chosen this medicament and have been very pleased with the results. There is never any guarantee that SDF will be the best solution; in some cases, the decay is not arrested and further restorative treatment is required. Also, not everyone is a candidate for SDF application. SDF may not be effective or indicated in cavities which are deep or severe. Why is a restoration still required, even when SDF has arrested the cavity? SDF can only treat disease, and cannot restore function or esthetics to the tooth. Depending on the location and extent of the decay, capping or filling of the tooth is the only way to restore the teeth to full capability and appearance. 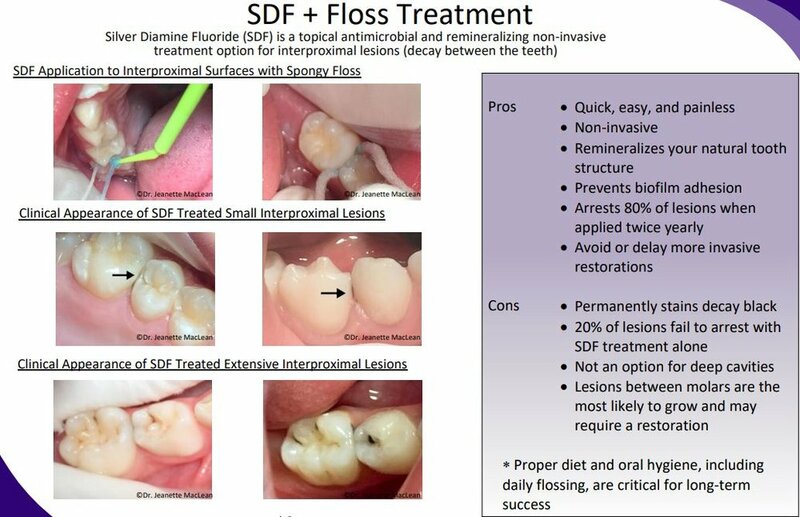 SDF is a wonderful tool that dentists can now use when immediate restoration is not possible or desirable.